On a damp morning smoke and steam rise from the Edgar Thompson Works in this view from Woodlawn Street in Braddock, Pennsylvania. Much of the commercial and residential infrastructure of this section is in disrepair leaving the remaining residents among relics of a once thriving community that looked to mill for life. 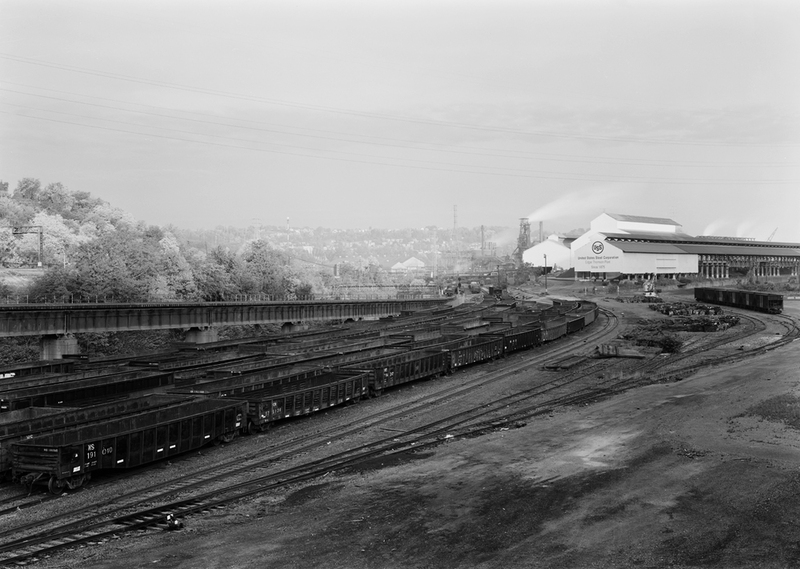 Since the first heat of molten steel was tapped in 1875 The Edgar Thomson Works has produced steel continuously along the banks of the Monongahela River in North Braddock, Pennsylvania. Constructed by Andrew Carnegie the plant was named in honor of his friend and president of the Pennsylvania Railroad, J. Edgar Thomson. Carnegie’s mill would be the prototype for many modern facilities to come, making use of the Bessemer process, an innovative way to economically mass produce steel by forcing air through molten iron to remove impurities by oxidation. The mill occupies the site of the historic battle where French and Indian Troops defeated the expedition of General Edward Braddock on July 9, 1755. Flanked by Turtle Creek and the Monongahela River the locale offers waterfront access to receive raw materials and ship finished product on the Ohio and Mississippi River networks. In 1892 the Edgar Thomson Works would be part of one most violent labor strikes in American history, the Homestead strike. In an attempt to disband the Amalgamated Association of Iron and Steel Workers in Carnegie’s Homestead Works, Henry Clay Frick and Carnegie locked out workers when negotiations for the union organization went sour. Employees at the Homestead works picketed for roughly five days, with plant workers at both the Thomson and Duquesne Works joining in sympathy. Picketing turned violent when plant owners brought in the Pinkerton Guards instigating a full-scale riot that resulted in ten deaths and thousands of injuries. State Governor Robert Pattison sent two brigades of the State Militia to disperse the chaos and resume operations with temporary strike breakers. Mill owners continued fighting the efforts to unionize steel labor for years, causing other violent outbreaks until 1942 when the AA finally merged with others to create the United Steel Workers Union, gaining momentum to unionize major steel mills all together. East end view of the Edgar Thompson Works reveals one of the remaining blast furnaces which produce the raw steel to feed the Mon Valley Works which includes finish mills in Irvin and Fairless Hills, Pennsylvania. The complex rail infrastucture required to feed the mils is illustrated here: In the foreground there are staging yards for gondolas of scrap steel, the ram bridge that connects the ET Works to the Union Railroad main line, the Union RR right of way left center (note signal gantry) all of which are on the bank of the Turtle Creek. In 1901 Carnegie Steel was merged with the Federal and National Steel Companies under the direction of J.P. Morgan among other partners creating US Steel. Once the largest steel producer in the world, US Steel still produces roughly 25 percent of America’s domestic steel at several major facilities in the United States. Operations at the Edgar Thomson Plant continue and now employ a basic oxygen furnace and continuous caster in addition to the remaining blast furnaces. Operated under the auspices of the Mon Valley Works this operation is the last integrated steel mill in the Pittsburgh area with coke produced at the Clairton Works to the south, raw steel produced at the ET plant and finishing into coil and galvanized products takes place at the Irvin Works. Though the Edgar Thompson plant was served by numerous railroads most of it was done through interchange with the Union Railroad a wholly owned subsidiary of US Steel that was established in 1894 prior to Carnegie’s sale of the ET works. The Union Railroad grew into an expansive system connecting Carnegie’s Bessemer & Lake Erie with the industrial Mon Valley moving raw materials from Lake Erie and finished product to market. The Pennsylvania’s primary source of interchange was at Kenny Yard on the Monongahela Branch across from the works in Kennywood, Pennsylvania. Other companies interchanged with the Union Railroad including the Pittsburgh & Lake Erie, Baltimore and Ohio and the Western Maryland most via the P&LE gateway at Connellsville.